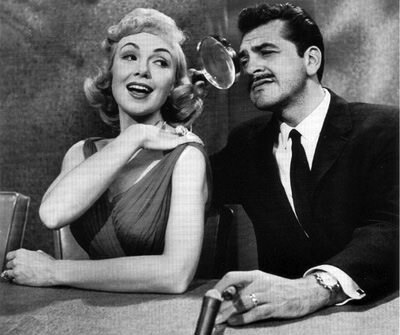 The story of Edie Adams and Ernie Kovacs is the tale of an unappreciated genius (some might say a mad genius) and the woman who loved him. Above all, it is a love story and the lengths that a couple will go to express their love for their family. Ernie's dad, a Hungarian immigrant, had been a successful bootlegger in the Trenton, New jersey area, but when Prohibition came to an end the family fell on hard times. Never a great student, Ernie was deeply influenced by his high school drama teacher and received a scholarship to the American Academy of Dramatic Arts in 1937. While at drama school, his biggest source of entertainment was B-movies which only cost a dime to see. He paid his dues in various stock companies, but illness in 1939 confined him to hospitals for a year and a half. While hospitalized, he developed an appreciation for classical music from the radio as well as developed his comedic talents entertaining doctors and fellow patients. Ernie's first paid entertainment job was as disc jockey and "Director of Special Events” for WTTM, Trenton. He won his first television gig in 1950, at WPTZ in Philadelphia when he showed up to the audition wearing a barrel and shorts. His Three To Get Ready morning program was the earliest regularly scheduled major market morning show (predating NBC's Today by more than a year). 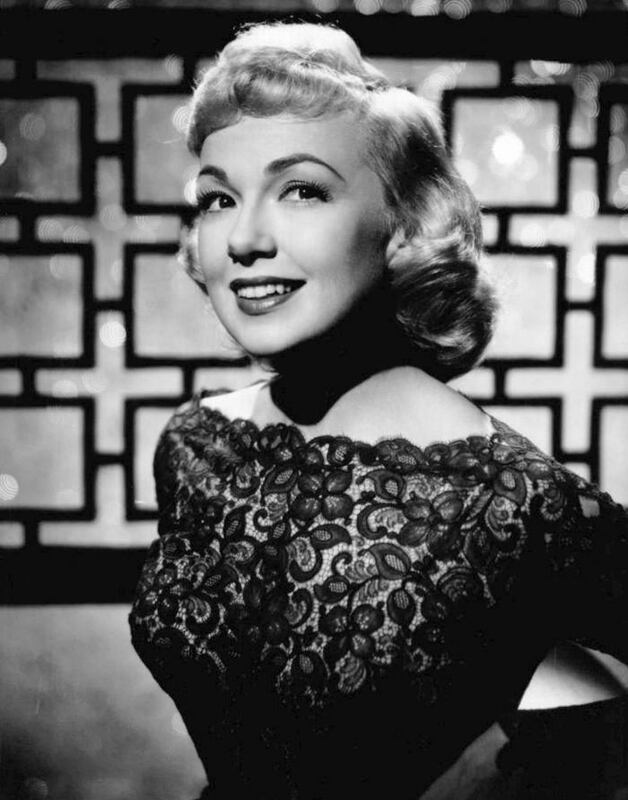 The show's producer brought a pretty blonde classically trained singer named Edie Adams on board. Edie came from a decidedly middle class background. Born in Pennsylvania, her family moved several times before settling in Tenafly, New Jersey. Her mother taught her to sing and play piano while her seamstress grandmother taught her to sew. Edie began making her own clothes in the sixth grade and eventually chose to pursue music over fashion by the toss of a coin. A graduate of Juilliard and the Columbia School of Drama, when Edie auditioned for Three to Get Ready she only knew three popular songs, and had to sing them all at the audition. Kovacs later said in an interview "I wish I could say I was the big shot that hired her, but it was my show in name only--the producer had all the say. Later on I did have something to say and I said it, 'Let's get married." Kovacs was divorced from his first wife in 1952, and in a precedent setting case awarded custody of his two daughters. He also began courting Edie with wild abandon, using classy moves like hiring a mariachi band to serenade her backstage while she was working on Broadway. The couple finally eloped to Mexico City in September, 1954. They often appeared together on Ernie's TV shows. Ernie had a job as a morning radio personality in New York City while Edie was appearing on Broadway. He disliked eating breakfast alone, so rather than wake her early after performing, he hired a taxi driver whom he gave a key to the apartment. The cabbie would let himself in, fix breakfast for Ernie and himself, then drive him to the WABC studios. Eventually Hollywood called on Ernie, and while he was filming Operation Mad Ball (1957) he fell in love with the laid back Californian lifestyle. As soon as Edie finished her engagement in Lil Abner the family moved to the West Coast. Their daughter Mia Susan Kovacs was born in 1959. 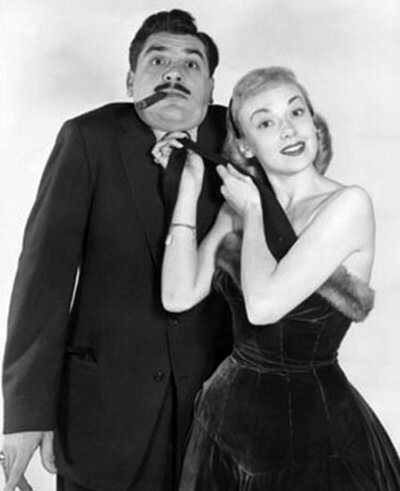 In 1960, they appeared as themselves in the final episode of the Lucy-Desi Comedy Hour (it would be Lucille Ball and Desi Arnaz's last appearance together, the divorce was already in the works). Ernie was disenchanted with pretentious Hollywood funerals, and left instructions with Edie that his was to be a simple affair. The pastor did eulogize that Kovacs had wrapped up his life in two sentences: "I was born in Trenton, New Jersey in 1919 to a Hungarian couple. I've been smoking cigars ever since." He also left Edie with a mountain of debt. Kovacs objected to the tax system by refusing to pay, and his estate was hit with a huge tax burden. His first wife also sued for custody of the girls, resulting in an emotional custody battle which Edie eventually won. Her celebrity friends planned a TV benefit special for Edie and her family, but she put them off saying "I can take care of my own children”. She worked nonstop for the next year and it took several years to clean up the tax debt. She started Edie Adams Cosmetics which sold door to door, bought a 160 acre almond ranch and became the spokesperson for Sun Giant nuts, and did 20 years worth of commercials for Muriel cigars. From being mired in debt after Kovacs' fatal accident in 1962, Edie became a millionaire by 1989. 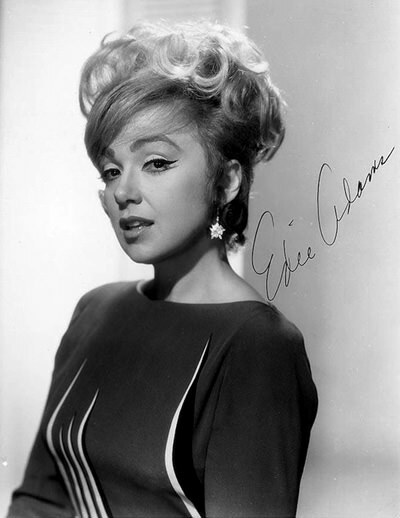 Be the first to comment on "Edie Adams"